The Ian Griffiths Collection. 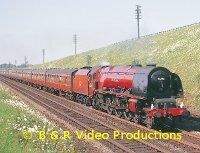 An archive film from the collection of Ian Griffiths portraying scenes of British Railways in the last ten years of steam from 1958 to 1968. Our film covers every region with many types of locomotives that existed during this period. We include some rare types ranging from small 0-4-0 tank engines to express engines which are not usually seen on archive videos produced today. We feature the London termini including Kings Cross, Euston and Waterloo. 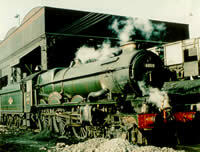 Many locomotive sheds are visited from East Anglia, South Wales, Nine Elms and Scotland. Rail tours are seen over the Waverley Route and from Paddington to North Wales. On the Southern Region we visit Guildford in 1964 and the Isle of Wight in 1965. On the Midland Region we visit Wellingborough, Leeds and Bescot. The Western Region is visited at Oxford and Dan y Graig, the Eastern Region at York, Retford and Cambridge. There are even some scenes on the Bedford to Hitchin line showing the making of the film “Those Magnificent Men in Their Flying Machines”. Finally, after the end of steam we see some views of LT pannier tanks at Neasden, preserved steam on the main lines in the 1980s and a visit to Dai Woodhams scrap yard at Barry. Overall a 90-minute memory of how it really was once. This all colour film has excellent detail and locations. It has been mastered with an authentic sound track and has an extensively researched, detailed and informative commentary. Cover photo:- Keith Pirt/Courtesy Booklaw Publications, 46245 “City of London” climbs Gamston Bank, June 1963. 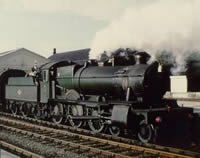 An archive programme of the CREWE to HOLYHEAD route via CHESTER and BANGOR. 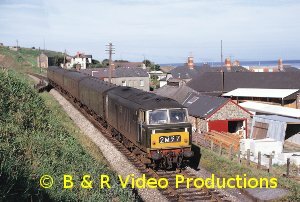 Filmed from 1960 to 1967 with occasional 1980’s visits from preserved steam locomotives providing a contrast. Motive power is mainly London Midland Region with Western Region at Chester. Branches from the route include BIRKENHEAD via HOOTON, the DYSERTH branch from PRESTATYN, DENBIGH from MOLD and RHYL, BLAEANAU FFESTINIOG and TRAWSFYNDD from LLANDUDNO JUNCTION and the AMLYCH branch. The PORT PENRHYN slate quarries to BETHESDA and DINORWIC system are also seen with narrow gauge locomotives. Locations visited include CREWE, CHESTER, SALTNEY JUNCTION, FLINT, TALACRE, RHYL, ABERGELE, LLANDUDNO, LLANDUDNO JUNCTION, BANGOR, MENAI BRIDGE and HOLYHEAD. Motive power includes Princess Coronations, Royal Scots, Jubilees, Britannias, Black 5s, 8Fs, Standard Classes and early diesels of Class 40 and 47, usually in green livery. Cover Photo:- Keith Pirt/Courtesy Booklaw Publications, 44780 near Abergele, June 1963. 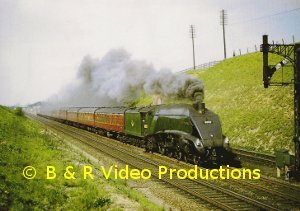 From The Brian Rogers Collection: A further look at British Railways steam traction from 1960 to 1967 filmed by life long enthusiast Dr. Brian Rogers of Worcester. Over half of the material was filmed on the Western Region where he lived. Wonderful scenes around WORCESTER with Castles, Halls, Granges and many freight types. The Midland route from GLOUCESTER to the LICKEY incline includes a footplate ride on a Bromsgrove banking engine. Visits to OXFORD, DIDCOT and HATTON. A drivers course on the BROMYARD branch. The Golden Valley line through STROUD and the last day on the KEMBLE branch. On to BRISTOL and down the Somerset & Dorset to BOURNEMOUTH WEST. The Southern Region shows plenty of Bulleid Pacifics at NEW MALDEN, CLAPHAM JUNCTION and in the New Forest. A visit to the ISLE OF WIGHT for 02 tanks in 1965. 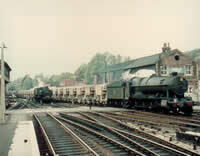 Southern H Class tanks at TUNBRIDGE WELLS gives more variety. View the long closed lines to ILFRACOMBE and TORRINGTON.The Midland Region at Water Orton and GRAYRIGG. Into Scotland from CARLISLE and a special on the WAVERLEY Route, STIRLING, GLASGOW CENTRAL and the Forth Bridge showing the old car ferry. Back to England for King Class 4-6-0s at BIRMINGHAM SNOW HILL and a little more steam around WORCESTER. An excellent colour film with an authentic sound track and an informative commentary.